Security envelopes - Buy now in small quantities. 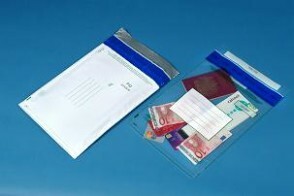 Postsafe, single use, tamper evident security bags or envelopes, for transporting valuable or sensitive goods or documents. Weatherproof, waterproof, burst, tear and puncture resistant, they feature a peel & seal, tamper evident closure, are sequentially numbered with a matching tear off receipt. This special offer stock is opaque white, sold in small quantities (packs of 10) and usually despatched within 2 days of receipt of order. * Please note, these products are only available to purchase online, for UK mainland customers. If you wish to purchase from outside this area, CONTACT US FOR A RAPID QUOTATION. Price excludes VAT which is added at checkout. Looking for price breaks for larger quantities ? Click here. Perhaps you require re-useable security bags, pouches, envelopes or holdalls ?